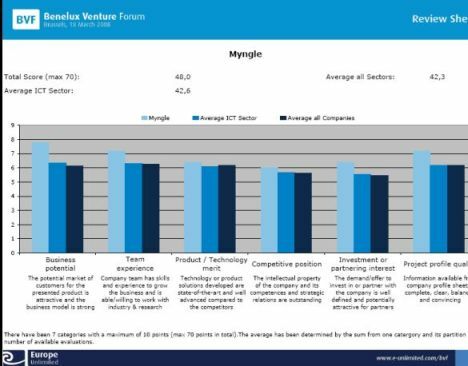 We are proud to inform you that Myngle got awarded at the Benelux Venture Forum as one of the 3 most promising ICT Companies in the Benelux, and will go forward to the European finals in December 2008! Benelux Venture 50Â is a Forum that promotes innovative entrepreneurship and venture capital in the Benelux region to the rest of Europe. On March 18th, the 50 most promising companies in the Benelux were invited to present in front of a jury of experts from the financing world and Venture Capitalistsâ€™ representatives. The companies were scored on 6 different criteria: Business potential, team experience, Product/Technology merit, Competitive position, Investment or partnering interest, Project profile quality. 3 industries were present: ICT, Biotech, cleantech. Myngle presented in one of the 3 pools for ICT. Each company had 8 minutes to present the business and 7 minutes for questions from the jury. As an Italian, I consider it a challenge to shorten all my enthusiasm about Myngle in â€˜onlyâ€™ 8 minutes of air time. But obviously those 8 minutes were the right ones as Myngle got selected as best in its pool. I started by introducing myself in Chinese, which arouse the curiosity as well as proving my point of importance of foreign languages in this increasing global economy. At the end of the round of presentations, Myngle got selected as best in its pool, which means one of the 3 best companies for ICT in the Benelux. We received the award and I got the chance to present Myngle to the larger audience in 1 minute pitch at the end of the day. We will get special visibility on the Europe Unlimited Forum for best Benelux Companies as Company to promote. We are invited to present to the European Venture Summit beginning December together with the best companies for each country/region. Participating to the Forum was interesting also because it gave me the chance to meet different investors as well as other â€˜colleaguesâ€™ entrepreneurs, listen to their presentation, learn about new businesses beyond Myngle. We are small but think big! Yes, there are still small and a lot of steps are in front to get Myngle where we believe it belongs. But we are ambitious! And with such a motivated team behind it we know we can travel all the way to that end. You will hear more about Myngle in the coming future. We hope that with the help of all of you we will build the great Myngle we all believe in, developing a platform that well understands its usersâ€™ needs and is continuously improving to satisfy them. This entry was posted on Tuesday, March 25th, 2008 at 7:19 am	and is filed under Myngle News, Press. You can subscribe via RSS 2.0 feed to this post's comments. You can comment below, or link to this permanent URL from your own site. Your comments will appear immediately, but I reserve the right to delete innapropriate comments. Good job Marina! What kind of questions did they ask during the Q and A. Do you think your strength was the presentation or the Q and A session? Thank you Rose and Michael! To answer to Michael’s question, questions were very varied, but a lot of interest on the quality of supply as well as potential for scaling in the future. I think the presentation was key to mke the first good impression, Q&A helped me to bring over more information to the audience I couldn’t fit in a 8 minutes story. Maybe the start was just right, with a couple of sentences in Chinese, which made my point over the importance of foreign language learning.